Rally for States’ Rights to Label GMOs! The battle for the right to know if your food contains genetically modified organisms (GMOs) could come to a screeching halt with the signing of one bill in Congress. We need to stop that bill in its tracks. H.R. 4432—the DARK (Deny Americans the Right to Know) ACT—was introduced by Rep. Mike Pompeo (R-Kan.) at the bidding of Monsanto, Big Food and the Koch Brothers. If passed, H.R. 4432 will strip your state of the right to pass a GMO labeling law. The DARK ACT will have its first hearing on Capitol Hill, on December 10. If we don’t turn out in numbers to protest this bill, our voice could be silenced. The Organic Consumers Association, with help from Friends of the Earth, Credo, Cornucopia Institute, Maine Sierra Club, Weston Price Foundation, Farm to Consumer Legal Defense Fund, Maine Organic Farmers and Growers Association, Green America, Mercola.com and other groups, is organizing busloads of people to attend the hearing, followed by a rally and an organic lunch. But if we want to have an impact, if we want to attract the attention of Congress and the media, we need a minimum of 1000 people to be there. Organize a bus from your area. OCA will help pay for a bus from your state to Washington D.C., if you can fill the bus. Call us at 218-226-4164 or email campaigns@organicconsumers.org if you want to organize a bus. Get on one of the buses that have already been organized. We have bus captains trying to fill buses in in Pennsylvania (one in Lancaster, one in Philadelphia), Boston, Central New Jersey, Detroit, Chicago, Indiana, West Virginia, New York City, Maine, Florida, S. Carolina, N. Carolina, Tennessee, and Georgia. If you live in one of those areas, please use the links below to find bus schedules and reserve seats. Here’s what will happen on December 10. 8 a.m. – 10 a.m. The hearing on Pompeo’s DARK ACT is scheduled to take place at 10:15 a.m. in room 2123 of the Rayburn House Office Building, 45 Independence Ave SW. We will gather there, with signs and banners, beginning around 8 a.m. As many people as can possibly fit into the hearing will attend. 10:15 a.m. When the hearing begins, everyone who didn’t get into the Rayburn Building will move to our permitted rally spot on the Capitol grounds, at the corner of Independence and 1st St. SE. There we will have a number of speakers who will address the crowd and the media. 11 a.m. – 2 p.m. After we wrap up the rally and speakers, we’ll move to the Capitol Hill Presbyterian Church, 201 4th St. SE (4th and Independence Ave, SE). Bring a black and red blindfold, to symbolize being kept in the dark. 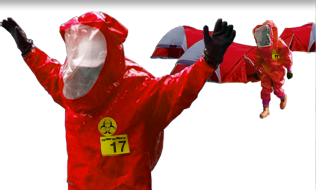 Red and black will tie in with our Stop Monsanto’s Attack on Democracy/Stop Sign image. 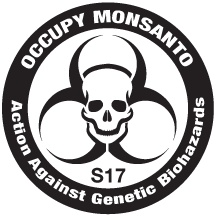 Please make a hand-made sign that says: [NAME OF YOUR STATE] Against Monsanto’s Attack on Democracy! We want to show Congress and the media that people have come from all around the country to protest this bill. Sign our petition asking Congress to reject Pompeo’s DARK ACT here. Make a donation to help offset the cost of buses, speakers, the press conference and organic lunch. Additional buses may yet be organized, so please check back. If you want to organize a bus, please email campaigns@organicconsumers.org, or call OCA at 218-226-4164. This could be the most important action you’ve taken yet to protect your right to know about GMOs. Come to Washington D.C. on December 10. Meet other activists! Hear some great speakers! And help us send a clear message to Congress that states should have the right to pass GMO labeling laws! St. Louis, MO — On Thursday, Nov. 27 at 1 p.m. EST, Reverend Billy and the Stop Shopping Choir will enjoy an organic Thanksgiving meal on the lawn of the world’s largest biotechnology seed company—Monsanto. After a banner year of bringing attention to big corporations’ role in climate disruption, Reverend Billy will conclude 2014 by confronting the company that is responsible for Agent Orange, PCBs, GMOs, Bovine Growth Hormone, Glyphosate and more. Known by millions as the most environmentally destructive corporation on the planet, Monsanto, for nearly two decades, has been controlling political campaigns and affecting the regulatory process of agricultural systems all over the world. In the U.S. alone, more than 90 percent of soybeans and 80 percent of corn are grown with seeds containing Monsanto-patented genetics. Industrial agriculture and the entire globalized food system, which is becoming more large-scale and centralized every day, destroys biodiversity, soils and local food systems, and is responsible for accelerating climate change by contributing more than 40 percent of global greenhouse gas emissions. Reverend Billy and the Stop Shopping Choir will premier their new show, Monsanto Is the Devil, with the Not Buying It Band on Sunday, Nov. 23 at Joe’s Pub at The Public in New York City. Then the troupe will travel by bus to St. Louis, meet at a local park on Nov. 27 and march one mile to Monsanto’s world headquarters to have a festive organic Thanksgiving day meal where they will perform songs from their new show. The choir will be dressed in stylish Pilgrim and honey bee costumes. This event is organized in collaboration with Organic Consumers Association, GMO Free Midwest, Gateway Garlic Farms and The Greenhorns. In addition to the Thanksgiving day meal, an online campaign has been launched encouraging people to take a pledge to cook an organic and local meal on Thanksgiving. Monsanto’s world headquarters is located at 800 North Lindbergh Blvd., St. Louis, Missouri 63167. 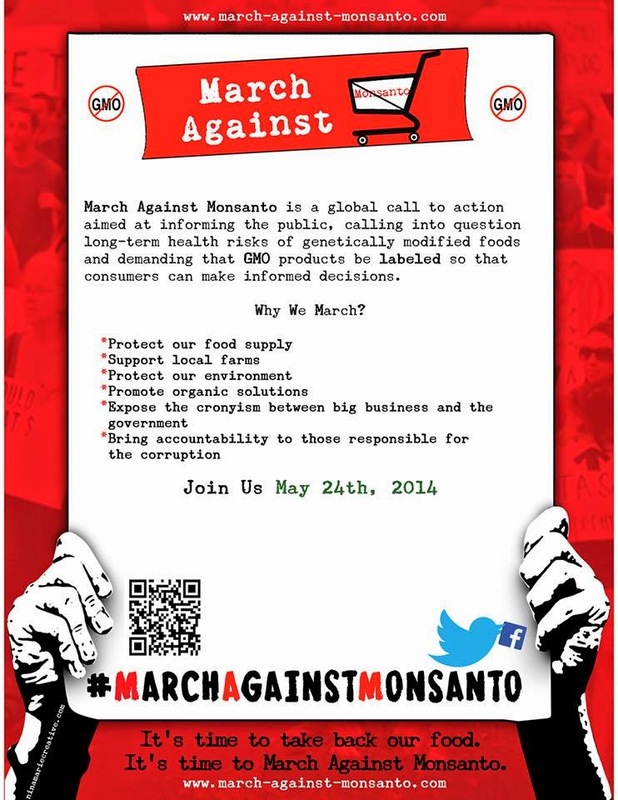 Follow #NoMonsanto hashtag for updates. Unfortunately, the shareholder resolution was withdrawn in October 2014 and will not be voted on at the 2015 Annual Shareholder Meeting. More details of the demise of the shareholder resolution can be viewed here [PDF]. Roundup interferes with CYP enzymes, disrupts the biosynthesis of aromatic amino acids by gut bacteria, and impairs serum sulfate transport. http://www.mdpi.com/1099-4300/15/4/1416 The consequences include gastrointestinal disorders, obesity, diabetes, heart disease, depression, autism, infertility, cancer and Alzheimer’s disease. People exposed to the spraying of Roundup suffer http://www.reduas.fcm.unc.edu.ar/report-from-the-first-national-meeting-of-physicians-in-the-crop-sprayed-towns/ increased incidence of infertility, birth defects, miscarriages, cancers, genetic damage (which can lead to cancer and birth defects), toxic liver disease, neurological developmental problems, kidney failure, respiratory problems, and allergies. In 2014 in Brazil, the Federal Public Prosecutor http://www.gmwatch.org/index.php/news/archive/2014/15365 requested the Justice Department suspend the use of glyphosate herbicides, and ordered the National Health Surveillance Agency to re-evaluate the toxicity of glyphosate. Roundup has been found in the blood, http://www.ncbi.nlm.nih.gov/pubmed/21338670 urine, http://www.foeeurope.org/sites/default/files/press_releases/foee_media_briefing_glyphosate.pdf and breast milk http://www.reuters.com/article/2014/05/27/us-monsanto-roundup-epa-idUSKBN0E72IH20140527 of city dwellers. Parents http://www.organicconsumers.org/articles/article_30153.cfm and pediatricians http://gmoinside.org/downsides-to-gmo-infant-formula-we-asked-a-pediatrician/ who have monitored children’s exposure to Roundup, have found that health improves when the herbicide is removed from their systems through an organic diet. Shareholders request that the Board establish an independent panel, controlling for conflict of interest, to publish by July 2015, at reasonable cost and excluding proprietary information, a report analyzing the extent to which Monsanto’s Roundup/glyphosate may cause the above health problems, and describing public policy initiatives, and Monsanto policies and activities, to phase out or restrict uses of Roundup/glyphosate that increase human exposure. Supporting Statement: Proponents believe the report should include all evidence linking Roundup, glyphosate, or Roundup’s inert ingredients or adjuvants, to the above health problems. 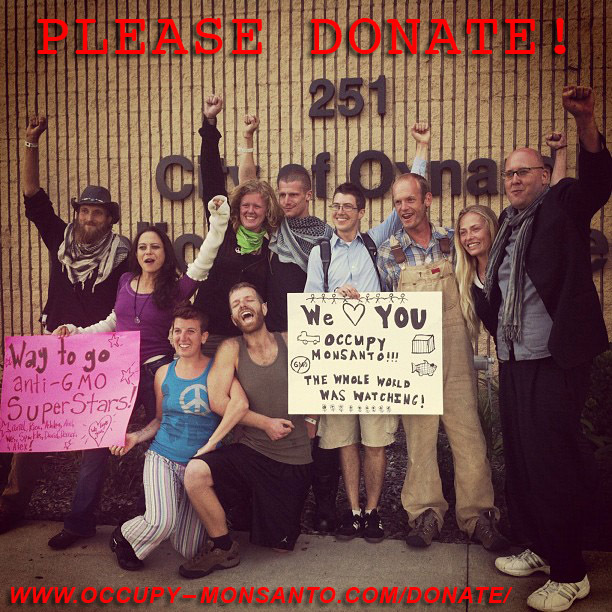 We need your help to pay for the Occupy Monsanto activists legal bills. Can you donate some money to help them out? Fast forward a year and a half, the city of Oxnard, California is figuratively throwing the book at these intrepid activists and charging them with over $8,300 in restitution & fines! This means they are being forced to pay Monsanto & the city of Oxnard or they’ll be arrested & forced to go jail! We can’t let this happen! This direct action made international news and helped inspire countless activists to begin their crusade against the evils of the Monsanto Corporation. Now these courageous activists need your help. Please donate as much as you can to help keep them out of jail.